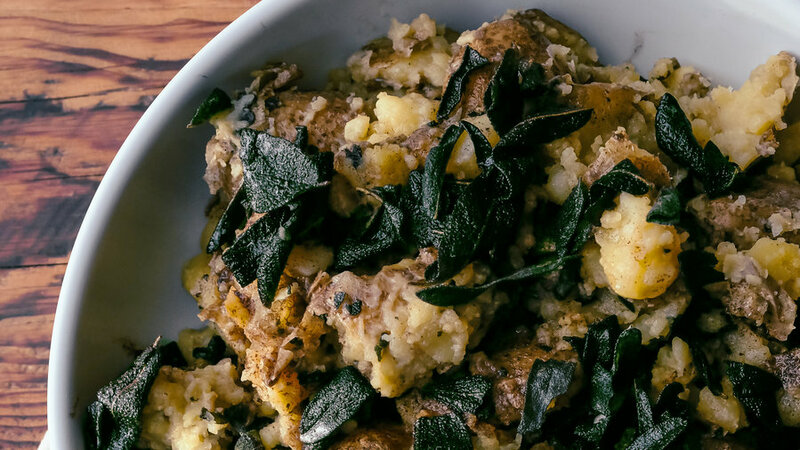 This recipe loads up garden potatoes with crisp sage leaves—but feel free to use less if you prefer a milder flavor. Either way, don’t pass up chicken pan juices poured on top. 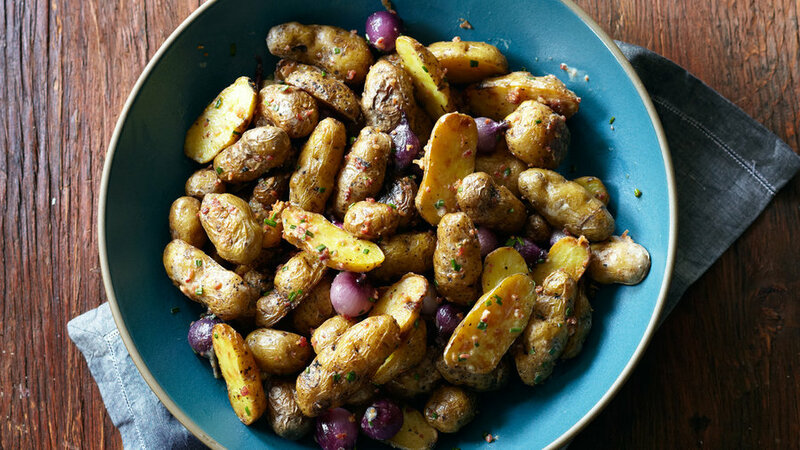 Crisp-edged bacon, starchy potatoes, and juicy onions together make an unbeatable side for just about any summer dish. 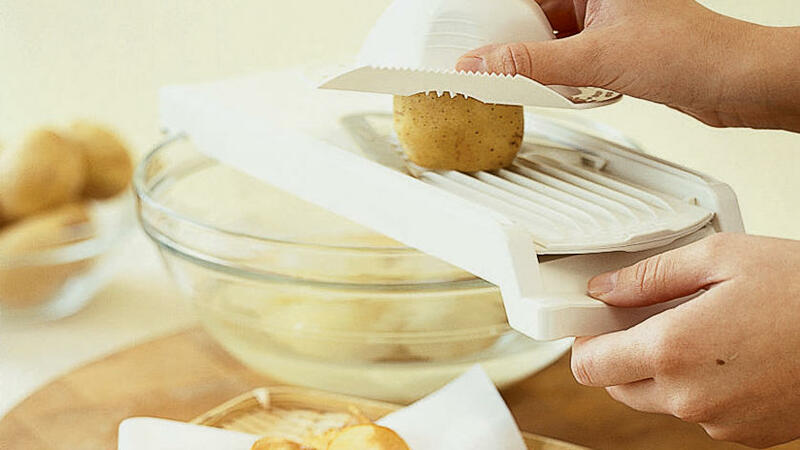 You’ll need 6 flat metal skewers, each 14 in., or a dozen 7-in. skewers. 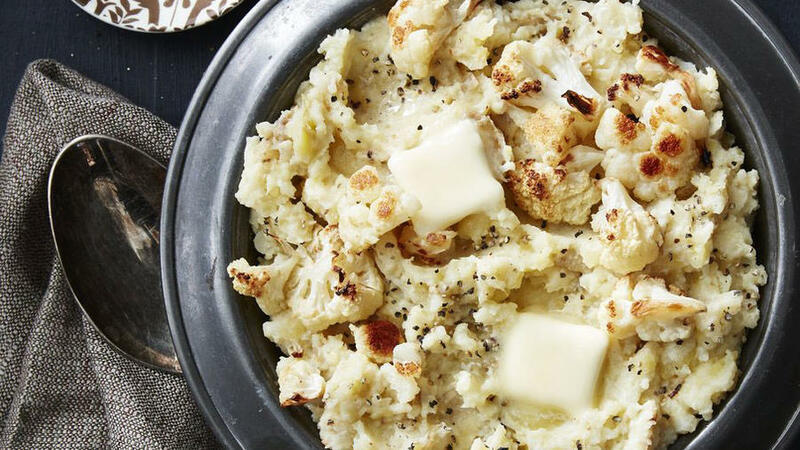 The tricks to achieving very creamy mashed potatoes are to not overcook them and to whip them just until smooth (if you overwhip, they’ll get gluey). 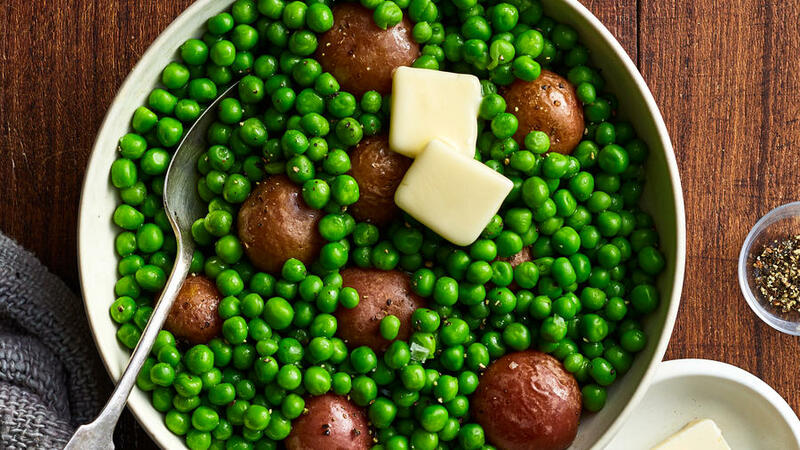 Serve some of the butter on the side, so guests can determine their level of richness. 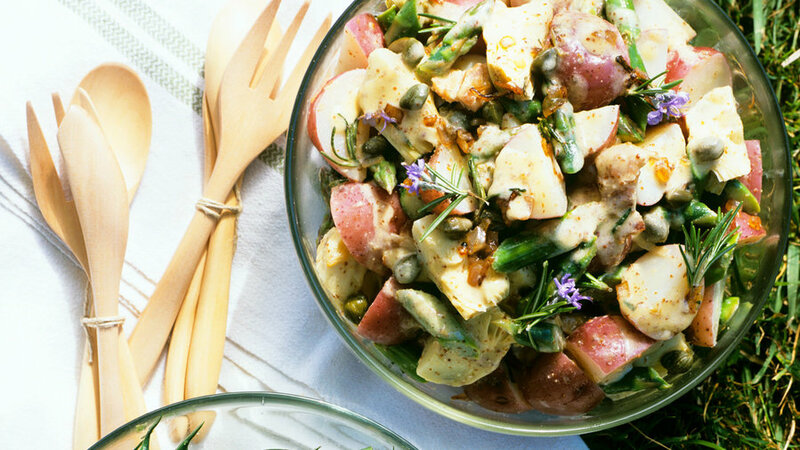 This creamy, zingy side dish celebrates the bounty of spring. 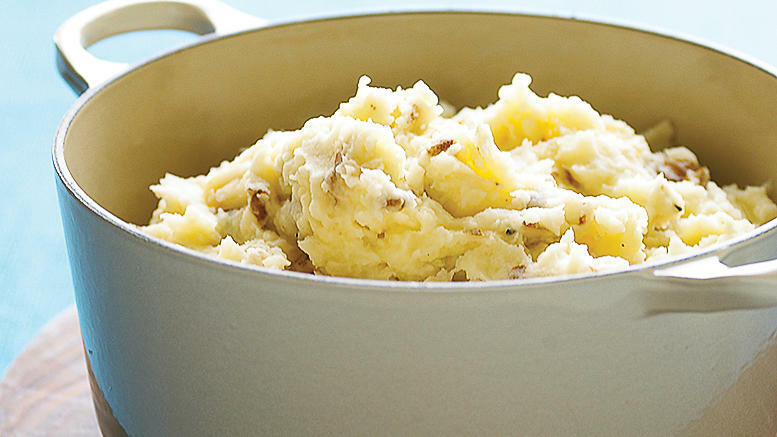 Roasted garlic, tangy buttermilk, and chicken stock pack a lot of flavor into these low-fat mashed potatoes. 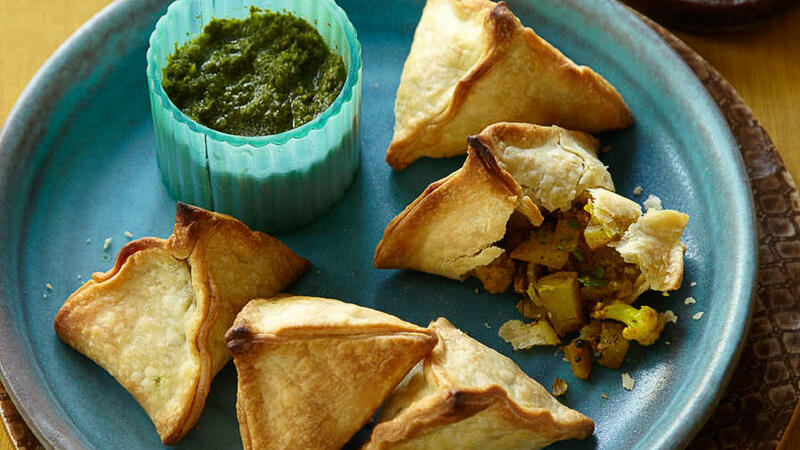 These spiced potato and cauliflower samosas with two chutneys appetizer is baked instead of fried, and made with purchased dough instead of homemade to save time. 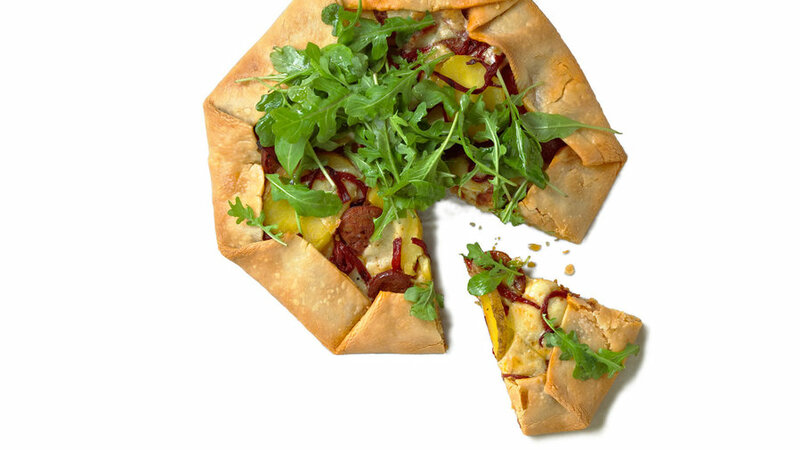 The beauty of galettes is their no-fuss, free-form shape. 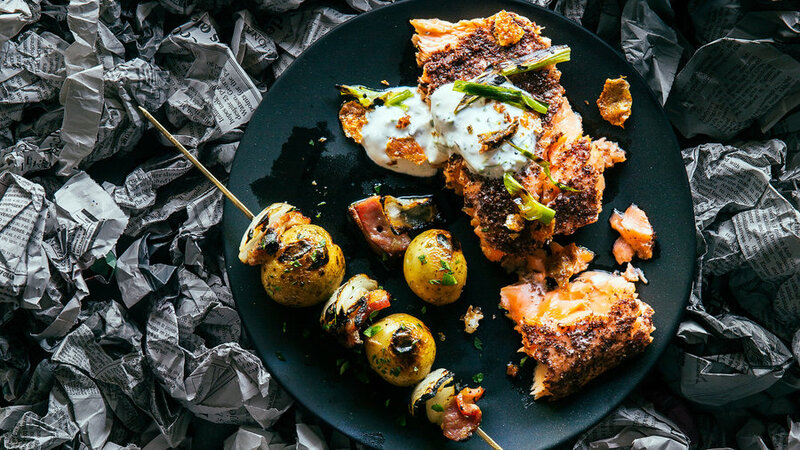 We’ve used two low-calorie tricks in here: broth instead of whipping cream, and neufchâtel cheese for rich creaminess with one-fourth the fat of butter. 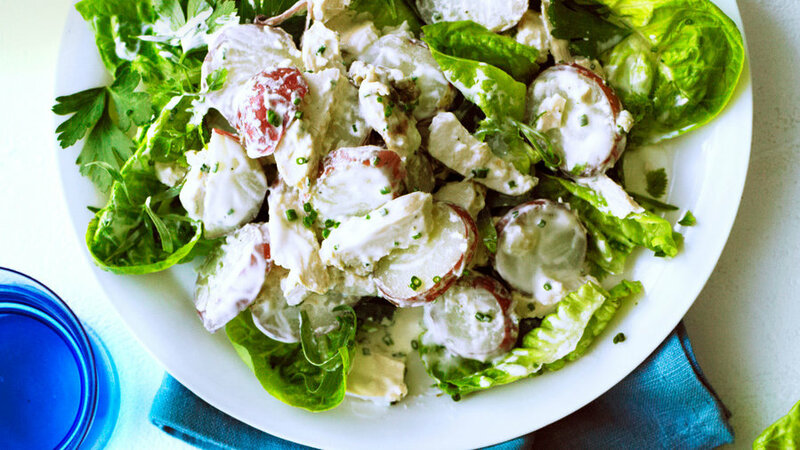 Using yogurt instead of mayo lightens up this chicken salad without sacrificing flavor. Good old vichyssoise, but with spinach and without cream―so it’s a beautiful electric green and kind to your waistline. 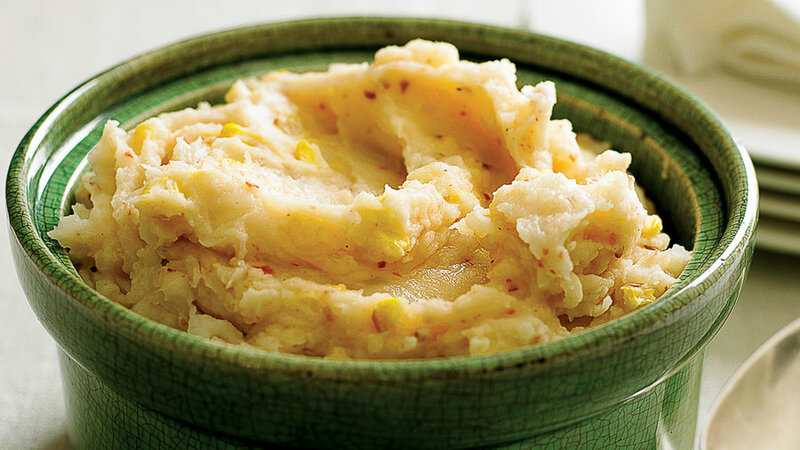 Mashed potatoes are good just about any way, but here they’re smoky, filled with crunchy bits of corn, and irresistible. 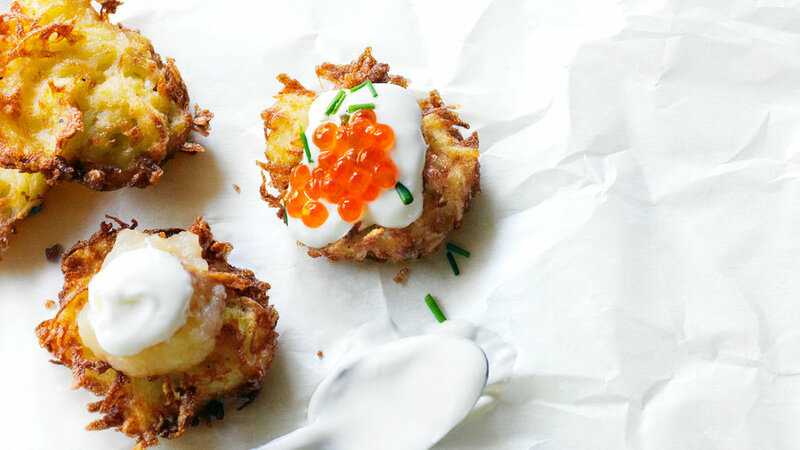 These potato pancakes are a bit lighter than the traditional version and will wow guests at a Hanukkah party. 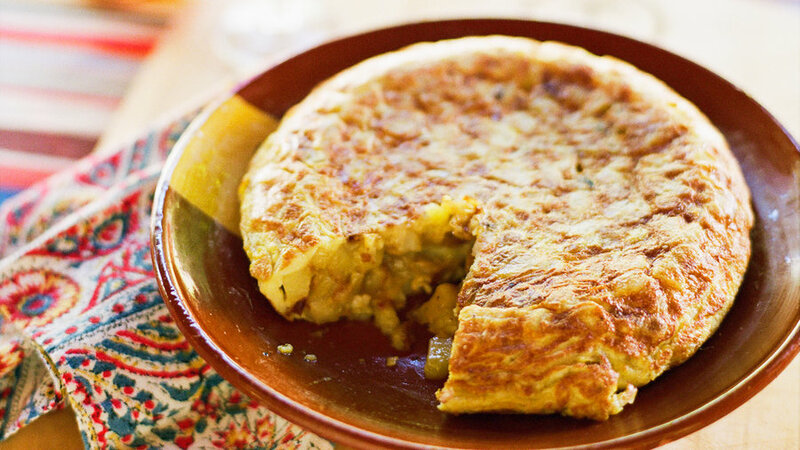 This Spanish classic is typically a thin omelet filled with fried potatoes and onions. 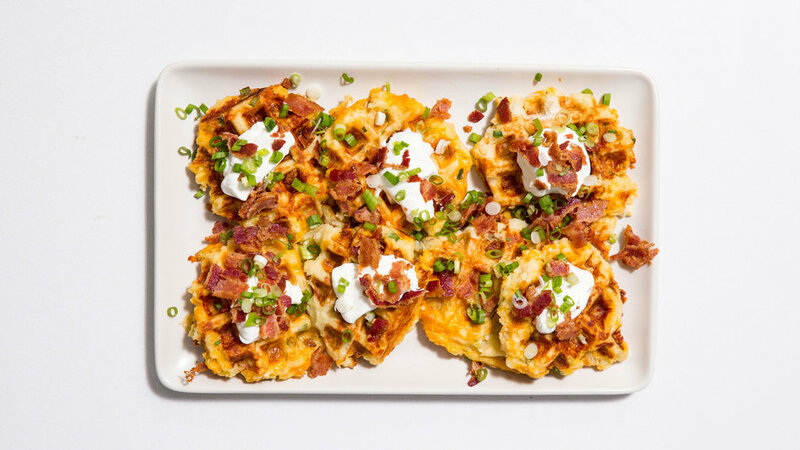 The recipe is easy to assemble, can be made ahead, warmed when ready, and is great for serving to guests as an appetizer or as part of a meal. 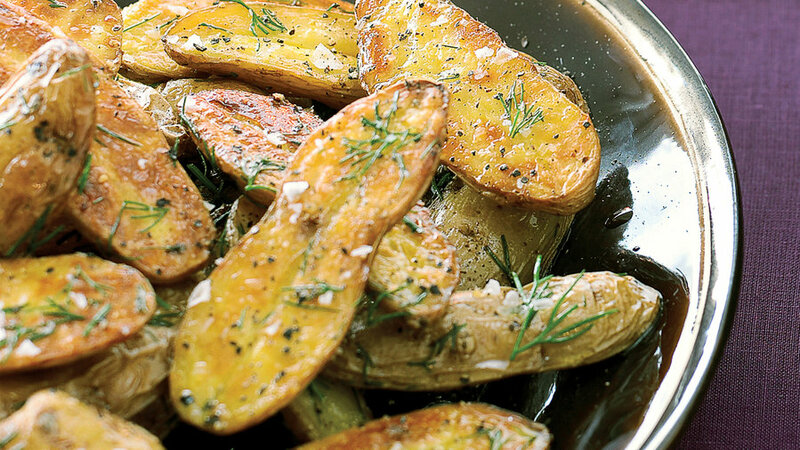 It's great on its own, but a little garlicky aïoli is good, too. The clean, bracing flavor comes from celery root―the weird, hairy vegetable that baffles many a cook. Here, we just slice off the hairier end, peel and chop the rest of the root, and boil it with the potatoes. 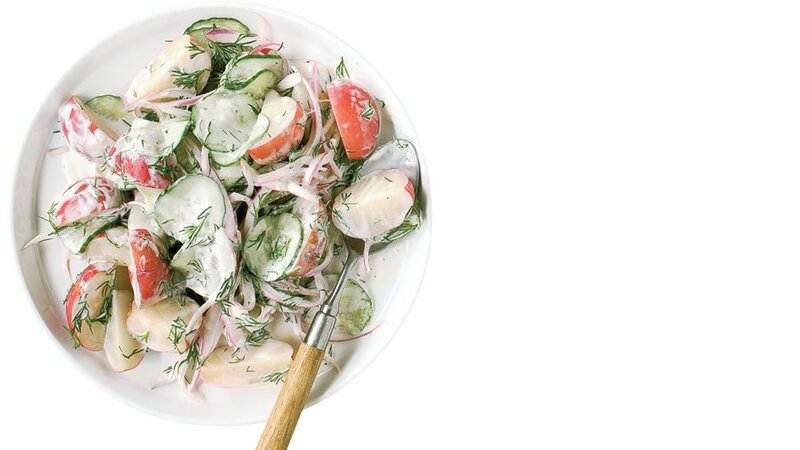 We love tzatiki so much that it inspired us to create this fresh version of potato salad with lots of dill, red onion, and cucumber. 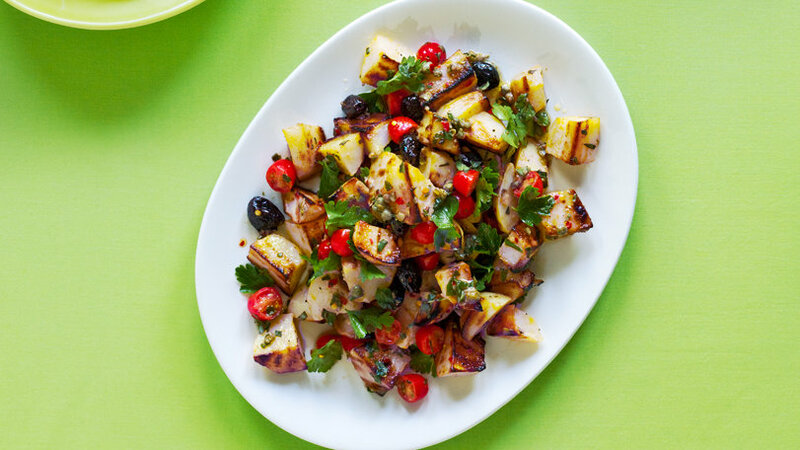 This would be especially great served with grilled lamb. 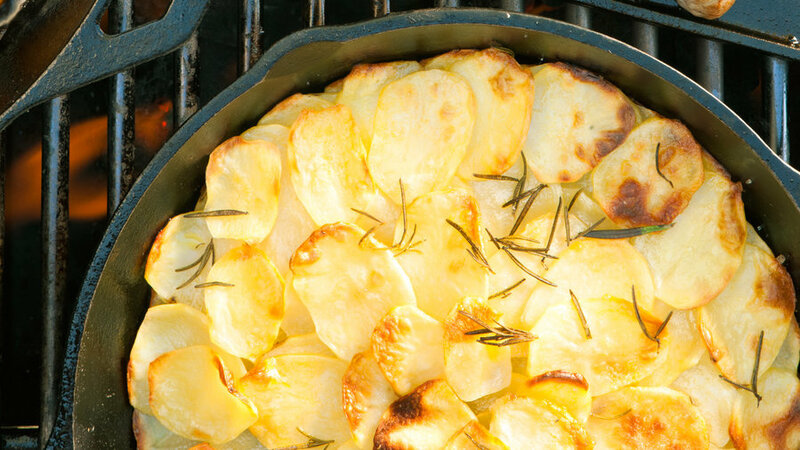 Using a skillet on the grill browns potatoes on the bottom, while the hot air inside the covered grill cooks the top. 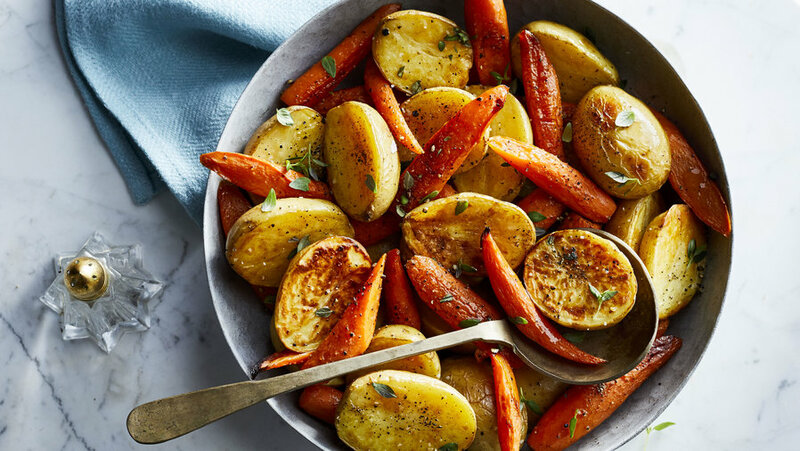 You wind up with a lightly crisped, delicious side dish. 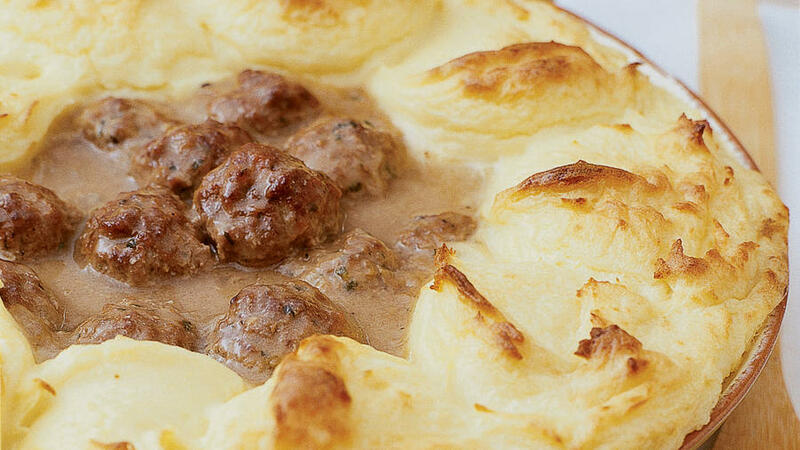 Spooned around the pie, mashed potatoes offer casual comfort, but they can be piped for a more formal effect. To lighten up the dish, you can substitute ground turkey for the beef. 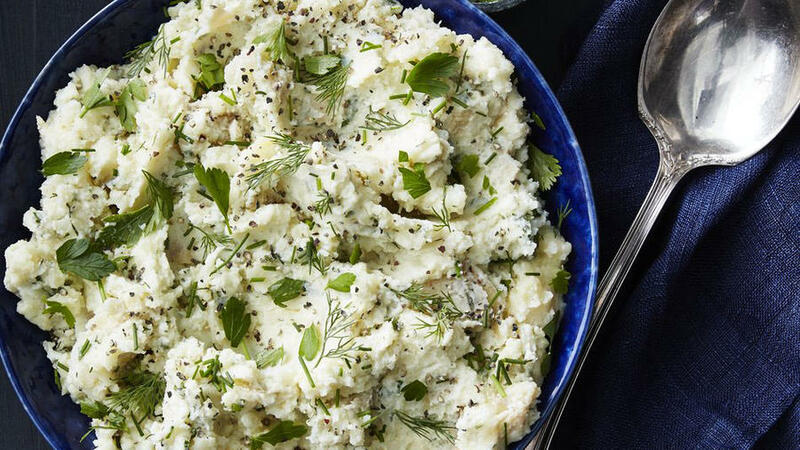 Sage adds an earthy flavor to these mashed potatoes, parsnips lend sweetness, and sour cream brings a bit of tang. 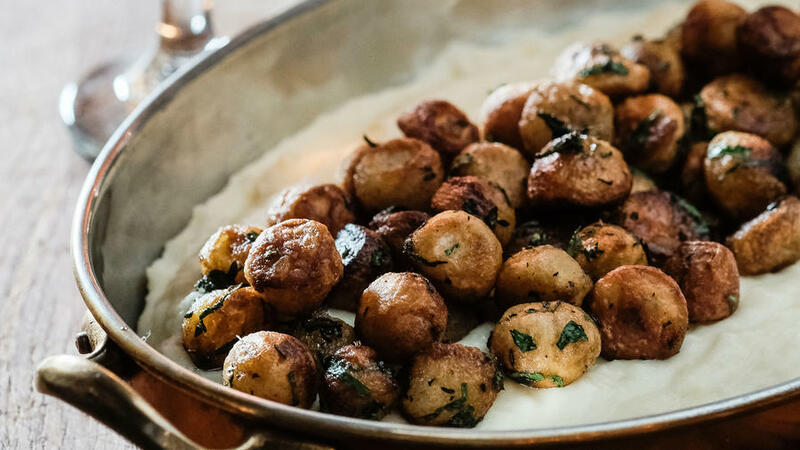 Enjoy the Hanukkah favorite any time of year. 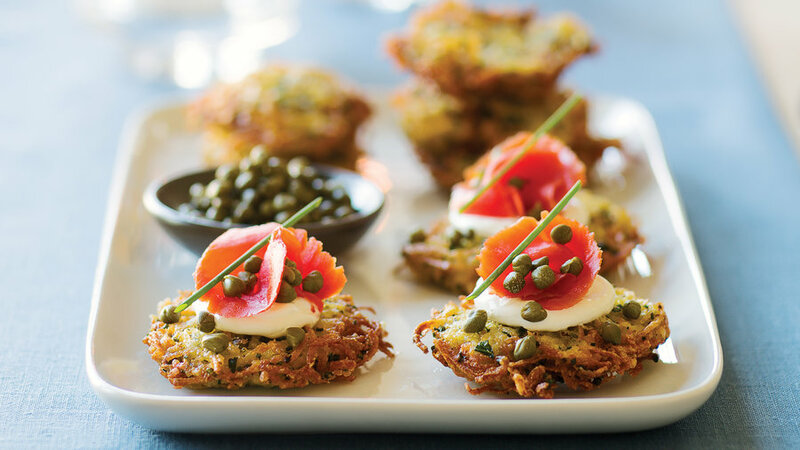 Flavored with chives, parsley, rosemary, and thyme, these elegant latkes make a great starter course or brunch entrée. 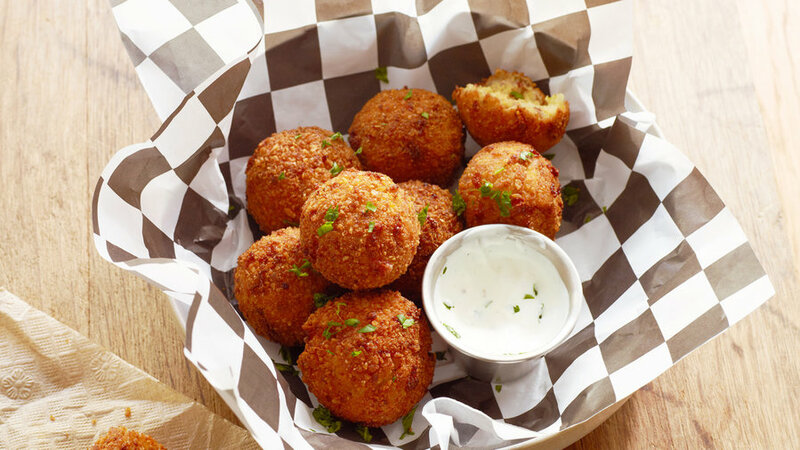 Making the ultimate snack food is surprisingly easy! Give it a whirl. 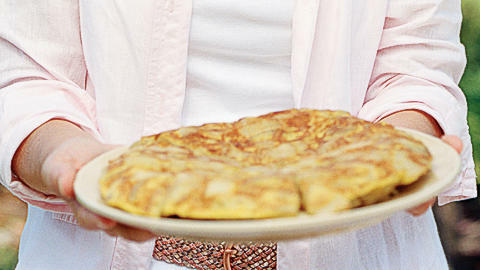 This omelet, almost solid with potatoes, is called tortilla outside Catalonia, Spain. 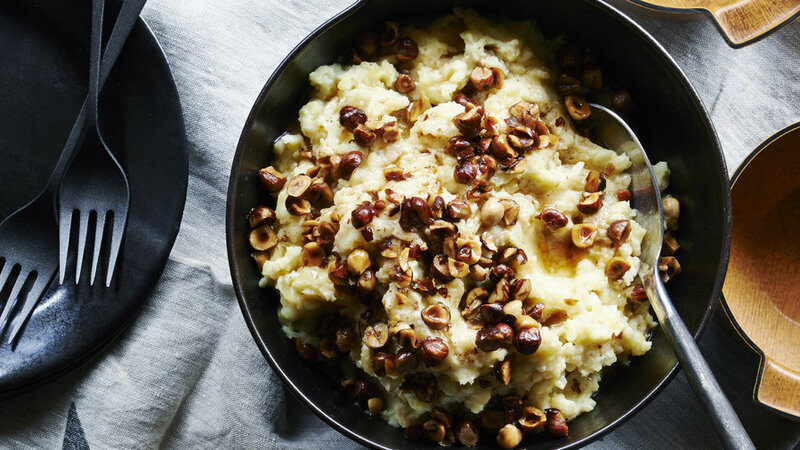 Rich, brown butter infused with the flavor of hazelnuts makes a decadent but easy addition to mashed potatoes. 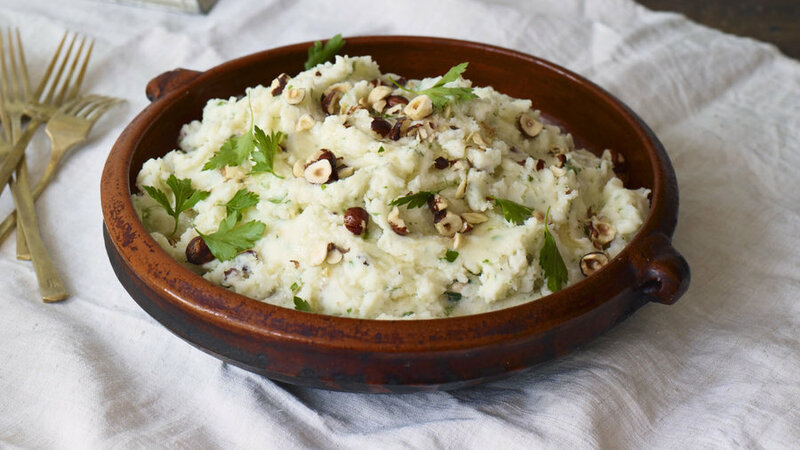 Mashed potatoes are even better blended with celery root, which has a gentle but penetrating flavor. Don’t be deterred by the root’s hairy exterior; just trim it off with a knife. 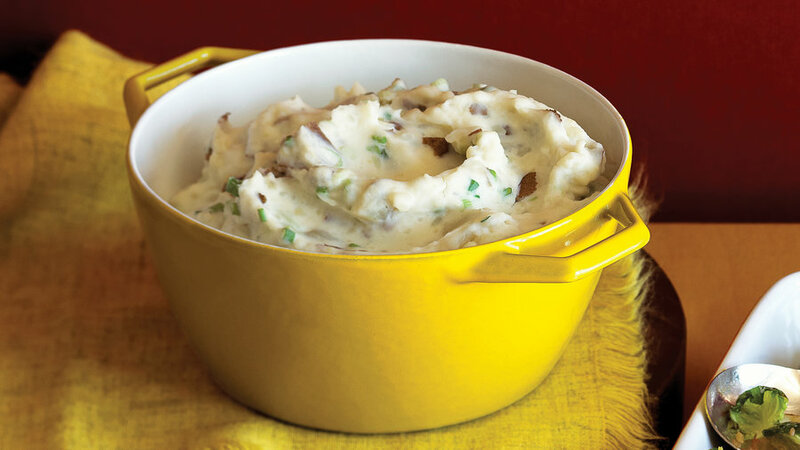 This recipe is adapted from one in Vegetarian Cooking for Everyone (1997), by Deborah Madison. 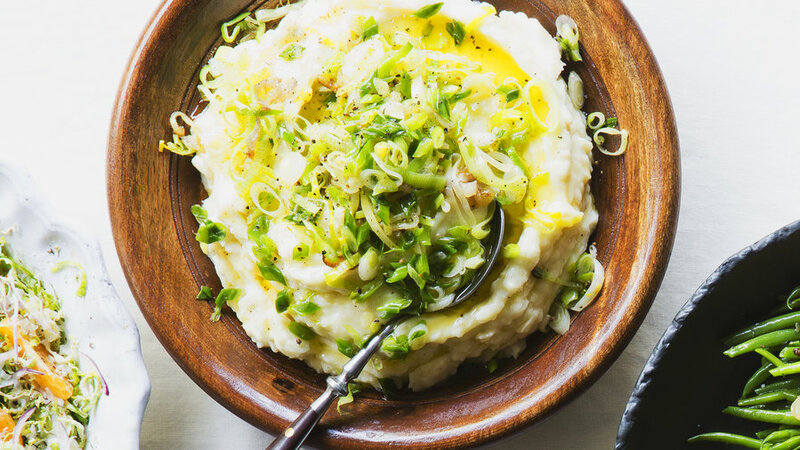 Leeks can be hard to clean, but they’re worth the effort for their sweet, subtle yet unmistakable flavor. 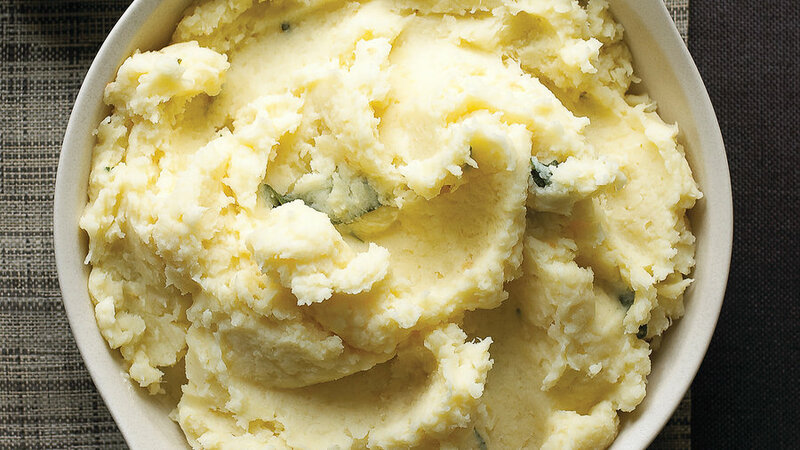 Cooked until very tender, they blend beautifully with mashed potatoes. Noisette, “hazelnut” in French, here refers to tiny potato balls that are are crisped until brown. 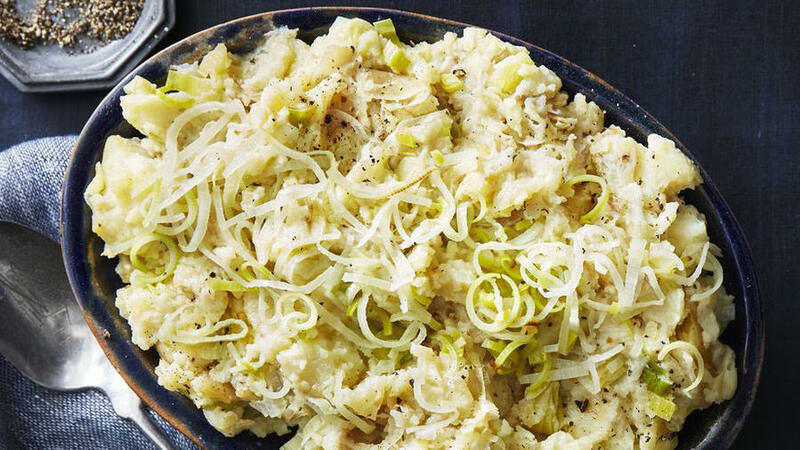 Then they’re piled on a bed of rich potato purée. 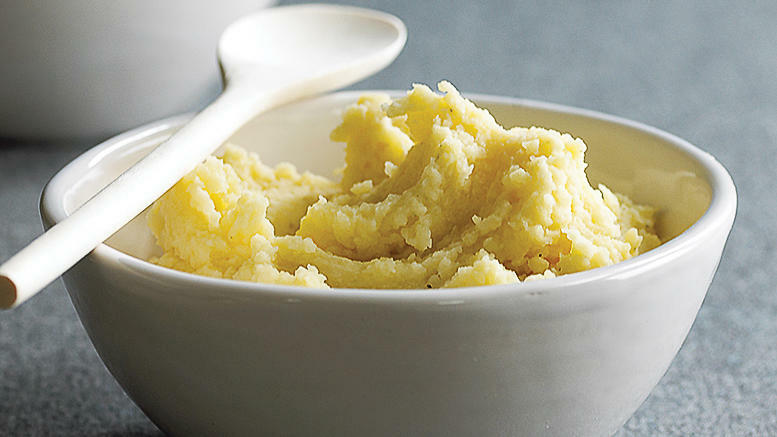 Despite the vast amount of butter, the purée doesn’t taste greasy. 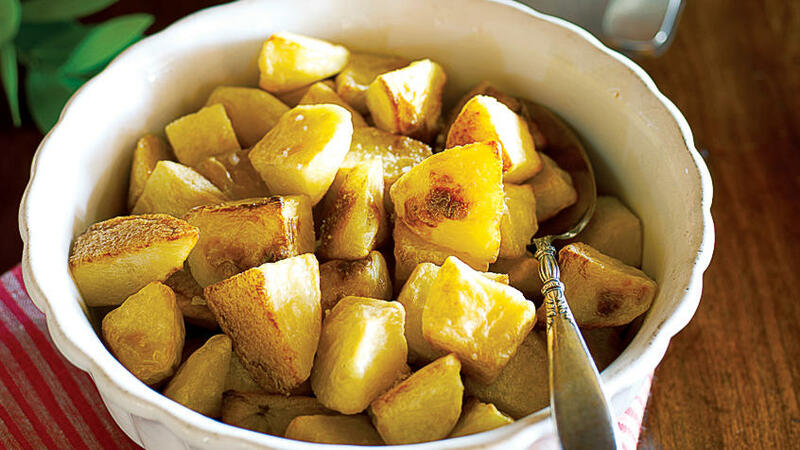 That said, you can still make luscious potatoes with half the butter. У нашей фирмы полезный веб сайт на тематику https://yarema.ua.